Atlantic South Region: "Lucky Strikes" play pickleball! On Monday April 29th, ten ladies from the "Lucky Strikes" Naples FL bowling league came to Lakewood Country Club of Naples for an introduction to pickleball and several hours of play. Weekly on bowling night they heard about pickleball from Jayne Rogers, USAPA Ambassador for the Naples area, and were so curious that they had to try it! Jayne Rogers along with teammates Paul Leeder, Tami Thomas and Joe Pucci gave a 5 point demonstration of the game to illustrate scoring and a few of the rules. Following the demo, each of the trainers took small groups to different courts to have the new players practice strokes and serves. After this short practice, each court started playing under the watchful eyes of each instructor. Most heard comment was "the serve is just like our bowling delivery"! 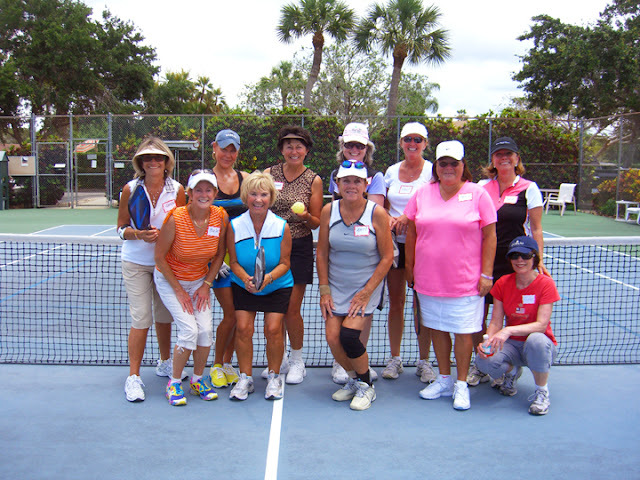 Everyone had a great time and all of these girls, who soon would head North, were determined to check out places to play in their areas so that upon their return next season they would have learned more about pickleball. Everyone was excited about learning something new that was so much fun!